Developed during the 1970s, the International Ultraviolet Explorer (IUE) was a joint project between the National Aeronautics and Space Administration (NASA); Particle Physics and Astronomy Research Council (PPARC), formerly known as the Science and Engineering Research Council of the United Kingdom (SERC); and the European Space Agency (ESA). The IUE was built to explore astronomical objects such as stars, comets, galaxies, and supernovae that exist in the ultraviolet portion of space. The IUE was defined as an "explorer class" mission. These missions are smaller in scope and the objective is a particular task, such as the study of ultraviolet radiation. Ultraviolet radiation is electromagnetic radiation (radiation that transmits energy through the interaction of electricity and magnetism) of a wavelength just shorter than the violet (shortest wavelength) end of the visible light spectrum. The Earth's ozone layer blocks ultraviolet radiation—which is harmful to humans—from penetrating the atmosphere. But the blockage makes it difficult to study ultraviolet radiation from the Earth's surface. In order to better understand ultraviolet radiation, an observatory must be created and sent beyond the Earth's atmosphere where the ozone layer does not interfere with the ultraviolet radiation. The IUE was such an observatory; it observed astronomical objects from space and relayed the information back to scientists on Earth. The IUE was launched in January 1978 aboard a Delta rocket and put into a geosynchronous orbit (an orbit that is fixed with respect to Earth). Weighing 1,420 pounds (645 kilograms), the IUE measured 14 feet by 5 feet by 5 feet (4.3 meters by 1.5 meters by 1.5 meters) and was powered by 2 solar panels. The IUE was equipped with a 17.7-inch (45-centimeter) telescope hooked up with two spectrographs (instruments that photograph spectra) that could record ultraviolet wavelengths and transmit the information back to observatories on Earth. At the time, the IUE was the only satellite observatory that worked continually 24 hours a day. While the IUE was orbiting Earth, astronomers monitored the information that the IUE was transmitting. Scientists at the Goddard Space Flight Center (GSFC) in Greenbelt, Maryland, handled IUE operations for sixteen hours a day and scientists at the Villafranca Satellite Tracking Station (VILSPA) in Spain operated the IUE for the other eight hours of the day. The ultraviolet telescope mounted on the IUE continually gathered information on astronomical objects. Geosynchronous orbit: When placed in orbit at an altitude of 22,241 miles (35,786 kilometers) above the surface of Earth, a satellite completes one orbit around Earth at the same time Earth completes one revolution on its axis. This means the satellite remains stationary over a specific location on Earth and is said to be synchronized with Earth. Ozone layer: The atmospheric layer of approximately 15 to 30 miles (24 to 48 kilometers) above Earth's surface in which the concentration of ozone is significantly higher than in other parts of the atmosphere and that protects the lower atmosphere from harmful solar radiation. By studying the light that is either emitted (thrown off) or absorbed by a celestial body (an object in the sky, such as a star, the Moon, or the Sun), scientists can learn about the activities that occur in space. They do this through the field of ultraviolet astronomy, the study of the dark absorption lines or bright emission lines of a spectrum. A spectrum comprises the colors of red, orange, yellow, green, blue, indigo, and violet. These colors travel at different wavelengths, decreasing in length from red (the longest) to violet (the shortest). When sunlight enters the atmosphere, materials present there break up sunlight into its component colors through reflection (bouncing off an object), refraction (bending through an object), or diffraction (bending around the edge of an object). It is from the individual spectrum lines that astronomers can understand the makeup of stars, galaxies, and other astronomical objects. For example, the more energy a star emits, the brighter it appears and the more ultraviolet wavelengths it sends off. The IUE allowed astronomers to better understand why the atmospheres of some stars are so hot and burn so brightly. The IUE made history when it helped make the first identification of an exploding star, named Supernova 1978A. In March 1996, the IUE observed the nucleus of the Comet Hyakutake as it underwent chemical changes during its five-day breakup. As the ultraviolet telescope continually sent back pictures to Earth, scientists learned that every time the comet passed the Sun, it ejected ten tons of water every second and that the eventual breakup of the comet involved only a very small piece of the comet. Other major milestones that the IUE aided in the study of are stellar winds (charged particles ejected from a star's surface); hot gas around the Milky Way (a galaxy that includes a few hundred billion stars, the Sun, and our solar system); the size of active galaxies; and stars with magnetic fields and surface activity. able to keep the IUE functioning at various capacity levels, the final shutdown occurred on September 30, 1996, after a joint decision by NASA and ESA. The IUE was awarded the U.S. Presidential Award for Design Excellence. It is considered one of the great success stories of astronomy as it made observations of over 100,000 astronomical objects during its use. Scientists from all over the world have enjoyed the information the IUE was able to collect. Over 3,500 scientific articles have been generated from this information, which is the most productive for any observatory satellite to date. Because of its endurance of almost nineteen years, the IUE was able to help astronomers gain a better understanding of ultraviolet astronomy. On June 7, 1992, NASA launched the successor to the IUE, another Explorer-class mission, called the Extreme Ultraviolet Explorer (EUVE). 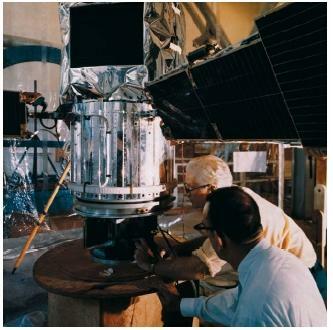 This satellite went beyond the coverage of the IUE due its more powerful telescope.